What you buy is just as important as how you use it. Counter-Strike: Global Offensive is a game about teamplay, individual skill and economy management. If you know when to use pistols you’ll be at a great advantage when it comes to economy and planning for future rounds. If you also know how to use them you can do some serious damage to your opponent’s game plan. Win the pistol round and you set yourselves up for a great half. If on the other hand you lose the pistol round, there are ways to limit the damage done to your economy. Needless to say you should practice pistols and pay attention to their strengths and weaknesses. The Glock-18, USP-s and P2000 have one thing in common: they don’t penetrate armor. However they do a lot of damage against enemies without armor, especially head armor. On the pistol round you only have $800, which isn’t enough to get a helmet. Because of this fact the three pistols mentioned above work really well in pistol rounds. A lot of the time it’s better to invest in armor than to upgrade to another pistol. There are exceptions, however, and I will get to them soon. Another option is to buy a few grenades as long as you have a plan. It’s also worth mentioning that one player on the CT-side could invest in a defuse kit. Nothing is more frustrating than killing the other team on an attempted retake only to find yourself in a situation where you don’t have time enough to defuse the bomb. The Glock-18 isn’t as accurate as the USP-s or the P2000, but it holds 20 bullets and has very little spread. This means it’s a really good pistol to run and gun with. What you want to do when you play the Glock-18 on pistol rounds is to get as close to your opponents as possible and aim for their heads. They are likely to be wearing body armor and the Glock-18 has the worst armor penetration of all the pistols in the game. It’s often wise to have one or two players buy flashbangs and a smoke just to make it easier for you to get closer to the defending players. Just don’t use Glock-18 on eco rounds unless you really need to in order to afford a full buy later on. These two pistols are insanely accurate over great distances compared to the terrorist counterpart. As a result, you want to do the exact opposite of what the terrorists want. Your job is to make sure you can keep the fight at long distances. As long as you can do that, all you have to do is to tap slowly and aim for their heads. The P250 is a great pistol that’s very accurate at medium range. It also has a lot better armor penetration than the Glock-18, USP-s and P2000, which makes it ideal for the second round if you lose the pistol round. The exception is if you’re on the terrorist side and got the plant but lost the round. In this case you shouldn’t buy anything at all, and go for a full buy on the third round instead. In particular, buy the P250 if you’re going to defend or attack an area where you think you can get close enough to steal an SMG with a fast headshot. These can be some of the most powerful pistols in the game if used correctly. The Tec-9 is one of the exceptions for pistol rounds that I mentioned earlier. One player can buy armor and have a teammate drop him a Tec-9. That gives the terrorists an almost impossible force of nature to lead the charge. It’s also a great weapon to buy on force buys if you’re planning on running a fast strategy. It’s super powerful and fires rounds really fast. It isn’t that accurate, however, which means you need to get close. Much like the Glock-18 it doesn’t have that much spread, so it’s ideal to run and gun with. The CZ75-Auto can one-shot people at close range even if they have head armor. It’s one of the most powerful weapons in the game, but it’s incredibly hard to control. It holds 12 bullets per magazine and it shoots really fast. This means that you have to lurk around corners and catch people off guard. You’ll most likely only get one chance, so make the most of it. If you manage to kill an enemy with either an AWP or an assault rifle you’ve done significant damage to the other team’s economy and it was a good investment to buy the CZ75-Auto. 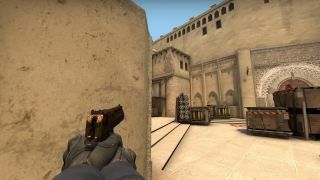 The Five-Seven can be equipped instead of the CZ75-Auto in the loadout menu for the counter-terrorist side. It holds 20 bullets and can kill armored players with a single shot to the head. It’s low spread and high armor penetration makes it great to spam bullets with at close range. If you’re a bit farther away from your target you should go for slower taps instead. At only $500 the Five-Seven is a great alternative to the P250 in the second round if you are feeling confident that you can take out at least one enemy. One of the game’s most iconic weapons. Over the years the Desert Eagle has given us a lot of highlight videos to enjoy and envy. I’m looking at you, Happy. The Desert Eagle costs $700, making it the most expensive pistol in the game. It’s really accurate at medium range and fairly accurate at long range as well and famous for its incredible one-shot potential. You can buy the Desert Eagle if you’re a great aimer and you know you can afford a full buy on the following round or if your team decides to force buy. It is a real hand cannon, so don’t underestimate its power. Master it and your opponents will have reasons to fear you even if you can’t afford the bigger toys.